The reason why I put this article in the New Parents Preparation section is because I think new parents should be aware and prepared in the event their babies are jaundiced. Without understanding what baby jaundice is, what you should or should not do, and your options, you may end up making mistakes like stopping breastfeeding when you don’t have to. So it is best that new parents learn about jaundice first before the baby arrives. I will not go into the medical details of jaundice. You can read it from this very informative article by Dr Jack Newman. Please do take the time to read it because it is important you understand what jaundice is and why you baby develops jaundice. Otherwise, you may panic and become fearful unnecessarily. It is especially common among asian babies but it has got nothing to do with ginger (despite what your doctor may tell you). There is no scientific basis to this claim. Unfortunately, some pediatricians in the hospital tend to behave as if baby jaundice is a serious condition that needs immediate and aggressive treatment. Sometimes, jaundice could be cause by some physical problems (e.g. ABO incompatibility, which will require blood transfusion). Serious jaundice can cause brain damage, but it is rare, especially in healthy babies, unless due care was not given. So there is really no need to panic. In fact, a recent study has shown that jaundice, or rather the bilirubin that causes jaundice, is actually a strong antioxidant that protects the baby’s cells! The most ridiculous thing that I have heard is a paediatrician in the hospital advising a new mother to supplement with formula just in case her baby develops jaundice. In other words, the baby was not even jaundiced yet. You don’t have to do that! If you are breastfeeding, there is no need to supplement with formula milk. Not even when your baby has jaundice (unless the jaundice level is exceptionally high). Certainly not for ‘just in case’ reason. What you need to do is to breastfeed more. It does not help at all, so don’t bother. Bilirubin is mainly eliminated through faeces and some through urine. Hence, what you want is frequent bowel movement to eliminate the bilirubin. Colostrum, which is your milk in the very early days of breastfeeding, has a mild laxative property. Hence, it only make sense for you to feed frequently right from the start so that your baby gets the precious colostrum. Speaking of colostrum, it is what is known as ‘liquid gold’ among the breastfeeding circle. It is full of antibodies and nutrients even though the amount is small. Health food stores market colostrum tablets made from animal colostrum. You have your own colostrum and don’t have to pay a single cent for it. So, you should really make sure your baby gets your colostrum. Even if you end up not breastfeeding later on, you would have given your baby a good start in life. There is also no need to suntan your baby in the sun – as in really doing it like sunbathing. Just bring your baby out for a walk in the morning when the sunlight is not too harsh yet. You will find the change of scene refreshing too. What we want is frequent bowel movement and good hydration to clear the jaundice. So you need to breastfeed very frequently (at least every 2-3 hours). Babies who are jaundiced tend to be very sleepy, so don’t rejoice just yet that you have a good sleeper. Wake your baby up to feed! When the jaundice level is high, your baby may need phototherapy to help clear the jaundice. Traditionally, the baby is warded for a few days and put under phototherapy light or bili-light. This arrangement was necessary but a great inconvenience for breastfeeding, especially when the mother has already been discharged from the hospital. And it is especially inconvenient for Chinese mothers who are kept at home due to confinement practice and unable to go to the hospital to be with the baby. If you are serious about breastfeeding, my advice is to forget about all confinement taboos and be at the hospital with your baby so that you can feed your baby as much as possible. Rely on pumping at this stage may jeopardise your milk supply and make breastfeeding even more difficult. Even when the mother stays in the hospital with the baby, conflicts often arise because the doctors and nurses would want the baby to be kept under the light for as long as possible but the mother may need to nurse the baby long and often (since she actually must nurse as much as possible to help get rid of the jaundice!). I do want to stress, at this point, that it is important to get the bilirubin level tested, especially if you baby seems very ‘yellowish’. Even though home therapy is available, if the level is too high, your baby may still need to be warded to be safe. Do consult the paediatrician on whether your baby’s jaundice level is low enough to do phototherapy at home. If you do phototherapy at home, keep monitoring the bilirubin level, follow the doctor’s instruction closely and in cases where bilirubin level is too high, listen to your doctor’s advice and ward the baby. I would strongly advice getting your baby’s bilirubin level tested regularly instead of simply relying on ‘eye-ball technic’ of just looking at the baby’s skin. This is because unless you are very experienced at detecting the yellow tint in the skin, you may miss it. 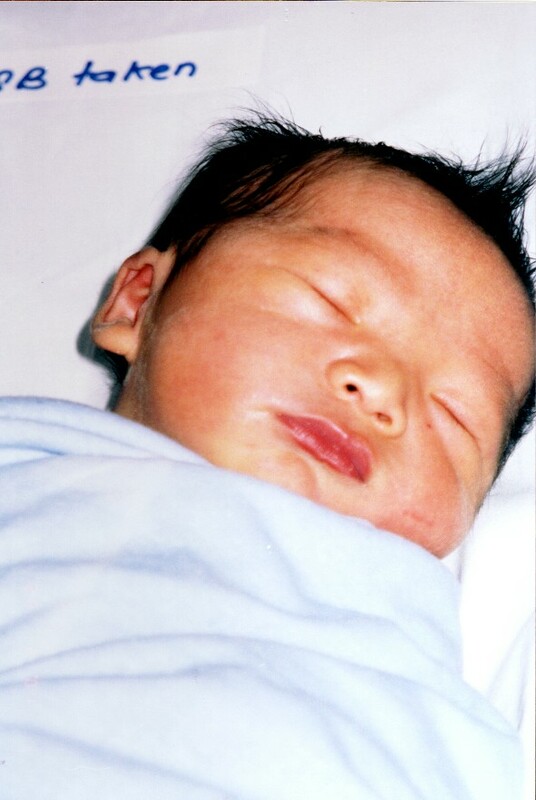 Newborns tend to be quite flushed and red so it can be easy to miss the yellow tint in the skin. After you and your baby are discharged from the hospital, you can get your baby tested for jaundice at any government polyclinic. It costs only about $10 each time, including the consultation with the doctor. Newborns always get priority at the polyclinic and can jump queue, so you don’t have to worry about long waiting time. The test involves pricking your baby’s heel and drawing a little blood. It does not take very long for the result to be out. After getting the blood drawn at the lab, you will be asked to wait outside one of the consultation rooms to see the doctor. The whole process from taking the blood to seeing the doctor can be done in less than one hour, especially if it was not a particularly busy day. Try to avoid weekends if you can because a lot of people will be bringing their babies there for vaccinations and jaundice tests, so even though newborns can jump queue, there will still be some waiting to do. There is no need to go to private paediatricians for jaundice tests. The polyclinic is cheap and good. Make good use of it. In the past, I encountered polyclinic doctors who were not very informed about breastfeeding and would advise me to supplement with formula milk to clear the jaundice. My latest experience was surprising good. All the doctors I saw were encouraging and advised me to continue to breastfeed as much as possible, and none of them tried to scare me into thinking that jaundice was a serious condition. In fact, they were all reassuring and told me that there was nothing to worry about (as though I was a new mother). I was very pleasantly surprised and touched. Maybe times have changed and doctors are better informed now. He was found to have ‘high’ jaundice and was put under phototherapy for 2-3 days. (My memory is a bit hazy now.) Since I was still in the hospital due to post-partum hamorrhage and needed blood transfusion, I conveniently requested not to be discharged until my baby was ready to go home. Since it was my first baby, and I have totally no experience with newborn, breastfeeding, jaundice, the whole package, the experience was quite overwhelming. There was a bit of conflict with the nurses because my baby was practically stuck to my breasts, which was not a good thing for them because he needed to be under the light. And since it was my first baby, and my milk was not in yet, we agreed to supplement with formula milk (fed by a cup) while I worked with the lactation consultant to get my milk production going. I still fed every 3 hours in order to keep the demand up so that the ‘machinery’ will start working. In between, when it was needed, the baby was supplemented with formula milk if not fed my expressed milk. Although I said earlier that there is no need to supplement with formula milk, if you find yourself too stressed over trying to feed your baby, especially if it is your first baby and you are struggling just to get breastfeeding started, it is ok to supplement a bit. Just make sure that the baby is not fed with a bottle. Keep working towards the target of reducing and eventually eliminating the need to supplement and while you are working at it, breastfeed as much as you can. If you need help with breastfeeding, get the help of a lactation consultant. Most of them are well informed about jaundice issue and will help you to deal with it while helping you to breastfeed. For me, by the time we were discharged from the hospital (I stayed for 5 days), my milk has come in and I was already breastfeeding my baby totally, without the need to supplement. We had to bring the baby to the government polyclinic for blood test everyday until his jaundice level dropped. During this time, I surfed the net and found out more about jaundice. That’s why when the polyclinic doctor again asked me to supplement with formula milk, I refused to do so and continued to breastfeed as much as I could. Because I was only in the hospital for 2 days this time, the baby and I were discharge before the hospital could tell me how jaundiced my baby was. We already know what we were going to do before the baby came. So we stuck to our plan, which was to monitor the baby ourselves – look out for yellow tint in the skin and the white of the eyes – and if need be, bring the baby to the polyclinic for blood test. If the yellow tint is not serious and the baby is feeding well and behaving normally, we would not bring the baby to the doctor at all but just focus on feeding as much as possible so that the jaundice would clear quickly. If phototherapy was needed, we would rent the equipment instead of getting the baby warded. From Day 1, I was feeding like crazy, as much as every hourly. Our 2nd baby had very slight jaundice that was barely visible. In fact, I don’t think it even qualified as baby jaundice really. Again, we planned to do the same as we did for our 2nd child. Again, I was discharged very quickly even though I had post-partum hammorhage again. I bugged my obgyn to discharge me the next day, so I was only in the hospital for 2 days including the time spent in labour. Again, I was feeding very frequently, but this time, the baby was more yellowish – probably because we had delayed cord clamping – and we brought him for blood test, just to find out the jaundice level and whether phototherapy was needed. We had called up the phototherapy light rental company and found out the lead time needed for the delivery and the costs, so we were all prepared. I was actually very surprised when the test result came back and showed that the jaundice level was not very high. In other words, there was no need for phototherapy. That was very good news. The polyclinic doctor also said that there was no need to do daily blood tests. Every other day would do. We did another 2 rounds of jaundice test and by the 3rd round, the jaundice level was already on a downward trend, so we stopped going for more tests. Disclaimer : The information shared in this article is not meant to substitute professional medical advice. Please bring your child to the doctor if you have questions or concerns regarding the health of your child.